In 2016, not long before the Urus launch, the CEO of Lamborghini Automobili, Stefano Domenicali, gave Studio Novembre carte blanche to explore options for renovating the compound at Sant’Agata Bolognese. The unconstrained design process led to the development of a guiding concept for near-future planning. The main front of the complex is composed of structures built in different periods and exhibiting a mix of styles. The proposed design would join these elements into a unified façade that communicates the essence of the brand. 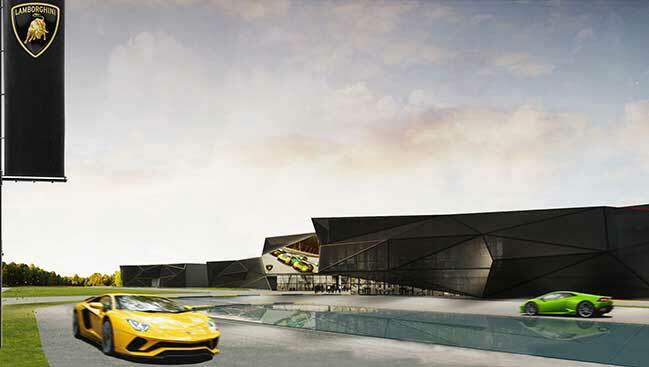 The vision for the façade to the left of the main entrance is a polygonal structure in black perforated sheet metal inspired by the lines of Lamborghini automobiles and contrasting with the reworked office block, which would be emptied out and fronted in full height glass. 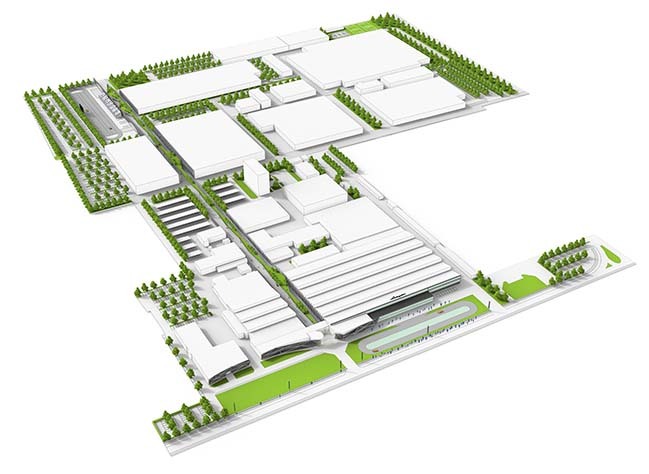 Studio Novembre also envisions redesigning and reorganizing the grounds with an area for auto demos as an ongoing point of attraction for Lamborghini fans. A new elevated walkway through the compound, the “Bauline”, divides circulation flows and offers alternative vantage points on the facility and the landscape around it. Strongly characterized by the presence of vegetation to emphasize the commitment that saw the entire plant going carbon neutral in 2015, the raised structure starts from the upper level of the entrance and leads to the test track at the back of the plant. 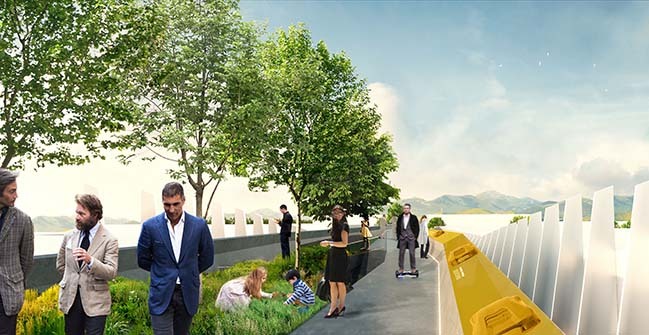 The walkway picks up the hexagon of the Lamborghini exhaust port and is a sort of physical timeline connecting the older buildings to those of the future: incorporating the progressive evolution of Lamborghini automobiles, the path becomes a small open-air museum. The façades of the various inner buildings, which stretch out for six hundred meters in different styles, are connected into a new, recadenced image for the long avenue. The entire Bauline is characterized by fins spaced at 3-meter intervals, following the heights of the buildings on either side. The fins evoke the two fundamental lines of Lamborghini automobiles, the roof line and the “tornado line”, giving a sinuous, undulating cadence to the long telescopic walkway.